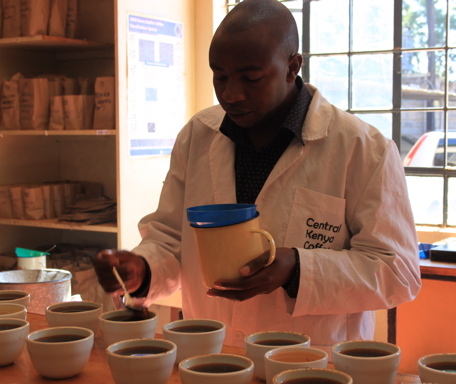 Today was the first of two days to be spent in Nyeri cupping at CKCM and visiting some of the local factories. At the mill we were greeted by Veronica who showed us to the meeting room and served us some Tegu which was really lovely, turns out she’s from that area, and being one of our favourite coffees it was nice to get a reminder of it. 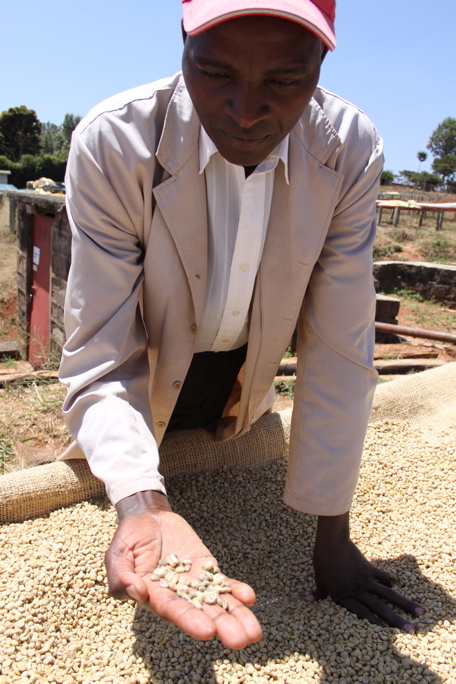 Mid cup, Philip Home came through to show us the workings of the mill, starting with the loading bay where a truck with 200 bags from one of the mills in Embu had just turned up. 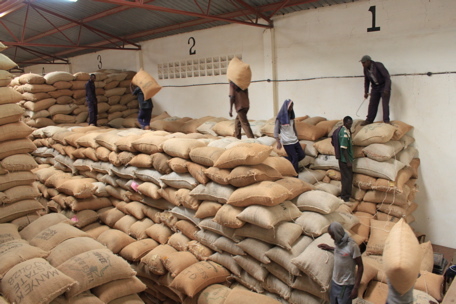 Right now they’re receiving about 5000 bags per day, and piling them to the rafters to fit it all in the warehouse. Many of the office windows on the 2nd floor that look down onto the warehouse were completely blocked with bags piled way high, and people who’d normally have their desks on the warehouse floor were being moved elsewhere just to make that little bit of room. 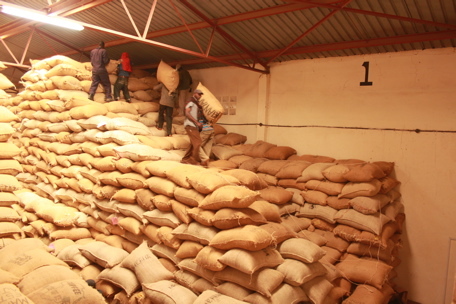 With such pressure on the system some of the early delivered lots are now at the back walls and at the bottom of these mountains of coffee, meaning that they have to wait to be milled while the crew try to cope just with the new volumes arriving everyday. Stock rotation looked like a massive headache, and I sincerely worry that this is adversely affecting some of the lots that are just sat waiting while they keep skimming the surface. 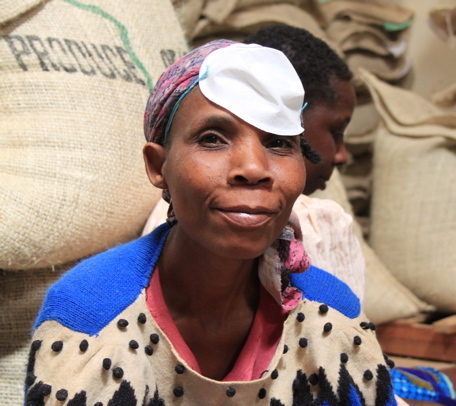 They’re processing about 1200 bags of clean green coffee per day, working two shifts just to get through it all, but it’ll still be some weeks till the coffee stops arriving from the factories. Lots of parchment is being held there, ‘conditioning’ or resting. In it self is not a bad thing, it’s just that with the temperatures these days the parchment could really benefit from resting somewhere a bit more temperature controlled. I do hope that if they are really expecting a similar crop next year, that they’ll set up their stock rotation systems a little better. 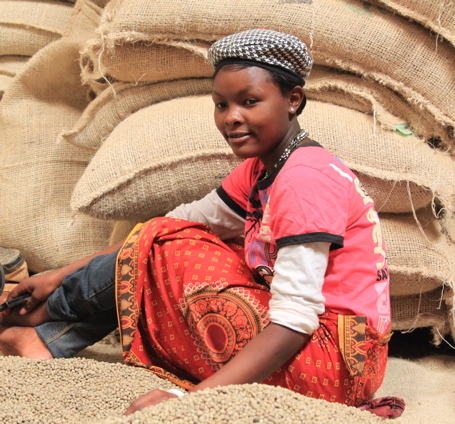 To their credit, the 50 people currently on shifts churning through the coffee were really going at a great speed, efficiently moving through all the stages needed to sort, bag and label the bags. 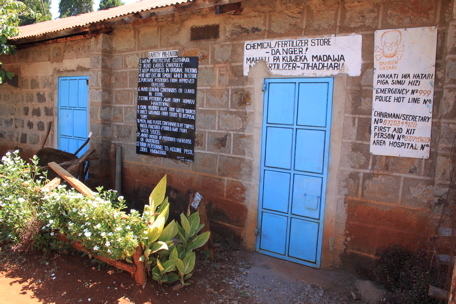 This is also where the samples for the auction room are prepared and sent to Nairobi. While watching the bags being sewn up I got an explanation of the tag that they stitch in the seam: AA is the screen size and 11/12 the crop year, 13 marks the week the coffee arrived (week one being the first week of October), CK is short for Central Kenya, and 0035 means the 35th truck that week. 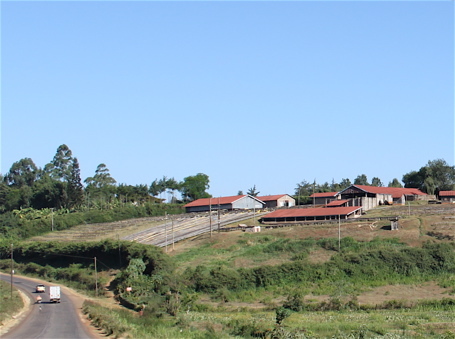 This outturn number basically tells them where the coffee is from, this being the Kibongoti factory in Kirinyaga. 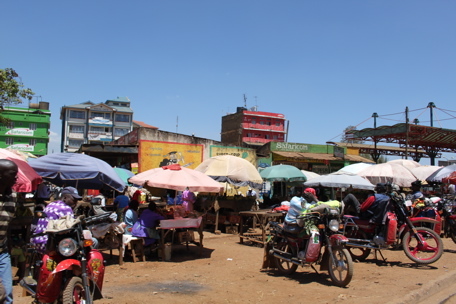 As we walked out towards their demo plot a truck with 250 bags of parchment from Tegu pulled up, and a truck of 700 bags of clean greens left headed to Nairobi to be sold. In spite of the activity levels everything was calm, running efficiently and at a steady pace, a testament to how well organized this place is. I do hope they will be able to perhaps expand their storage capacity in the near future. I’d also love to see the parchment stored in something else than jute and hessian in these conditions, but the cost of investing in bags is quite prohibitive for now. We also went for a quick look at the demo plot at CKCM, a lovely set up with everything you need for doing some interesting trials and experiments on growing and processing. Ben and I immediately started thinking about what we could do here if we had a few weeks to spare during harvest season. I might find out what Christmas in Kenya is like this year! While we’d been getting the grand tour, Ephraim, Sara and Ernest had set up our first cupping in the busy CKCM sample room- a medium sized space that fits in a space for sample storage, screen grading, moisture control, hulling, sample roasting, grinding, cupping, dishes and desks for a couple of people all in one. 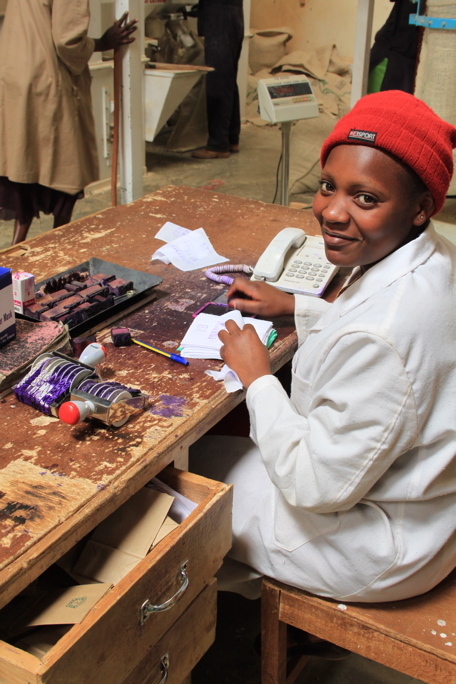 What their able to do in a limited space and with a huge workload is really impressive, in addition it was Saras first day on the job being trained on roasting and QC, and here we come getting in the way and asking a world of questions. 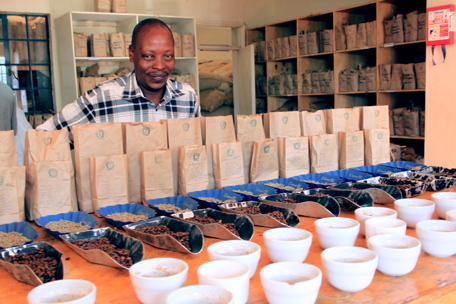 We cupped a selection of coffees we’d requested to see up front as well as a few that Ernest had pulled out for us, mostly arrivals from week 16 and 17 but also some that had come in yesterday and Monday. 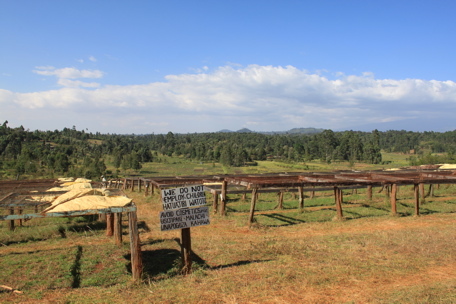 The samples were not all graded meaning we weren’t cupping fully sorted AA’s or AB’s, but even with that in mind we were finding a lot better aromas up here in Nyeri where the water is softer, compared to Nairobi. The taste was on the overall very good, but still that feeling that the crop this year won’t be showing up those stellar juicy fruit bombs kept creeping in. 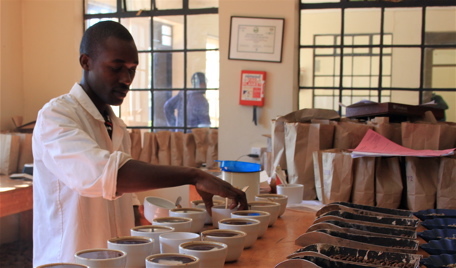 We’ll see, there’s a lot of cupping still to do and lots are still being processed, so there is still hope. Or, it could just be that Klaus was here last week and swept up all the fruit bombs right from under our noses! After some deliberation and discussions around roast level and what we wanted to cup next, we headed out to the Ngunguru factory, part of the Tekangu cooperative society (TEgu, KArogoto, NGUnguru) Anthony who is in charge of receiving cherry, and Franklin Wanjau Kario the general manager, gave is the rundown on their stats. This year their 650 member farmers from within an approx. 2km radius delivered 400.000 kg cherry, a big leap from last year when they only delivered 140.000 kg. Last year, with such a small crop and the market so high, they got paid 123 KES pr kg, and this year they told us the farmers were expecting closer to 200 KES/kg. The link between supply and demand obviously means this is not going to happen, and while we try to point this out everywhere we go it seems sometimes to fall on deaf ears. The farmers get a small payment upon delivering the cherry, and the rest of the money only when the lots are sold on to people like us. They’re free to deliver to any factory they want as long as the correct procedures are followed in registering, so can go where they think the price will be highest. Franklin has 1100 trees himself, and he used to manage and deliver to Karogoto, now in his first year at Ngunguru he of course delivered here. 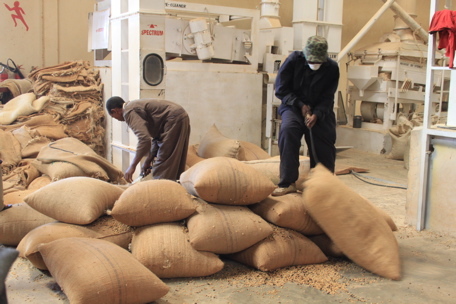 Some of the challenges he faced at Karogoto, with the pulping and drying sections being set far apart causing some problems with flow and efficiency, are not an issue at Ngunguru where everything is set up in one compound. The water access is good here, he’s happy with the equipment and the staff works hard, so he’s excited about the harvest and his main aim is to improve the payouts to the farmers. We talked at length about processing methods in other countries like El Salvador and Ethiopia, and the disadvantages and benefits within each country’s traditions. In the busy mid harvest weeks at Ngunguru, cherries are picked in the morning and delivered up until about 4pm. They have 2 pulpers from 1975, one 4 disc and one 3 disc, each disc capable of pulping 1000kg/hr. Pulping continues through the evening, and the parchment is channeled into the 14 fermentation tanks where they will stay for 16-24 with no water, till the mucilage feels ‘gritty’ and is considered ready to wash off. Through the washing channels the parchment is raked and pushed against the water flow to remove the sugars, before being filed into post soaking tanks where they will stay in water for another up to 24 hours, ensuring all remaining mucilage dissolves. 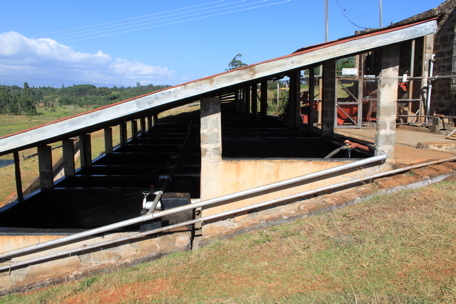 If they are extra busy and capacity is filled, they can skip the post soak, but according to Franklin the research done in Ruiru says the post soak improves the taste. 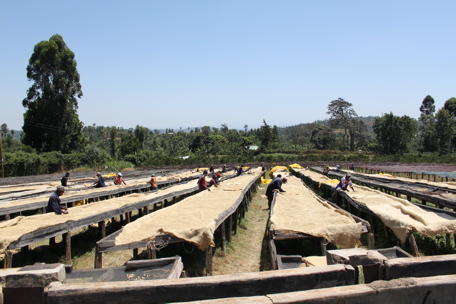 Once ready the parchment goes to the drying tables, where it is turned and cleaned continuously till ready for storage. 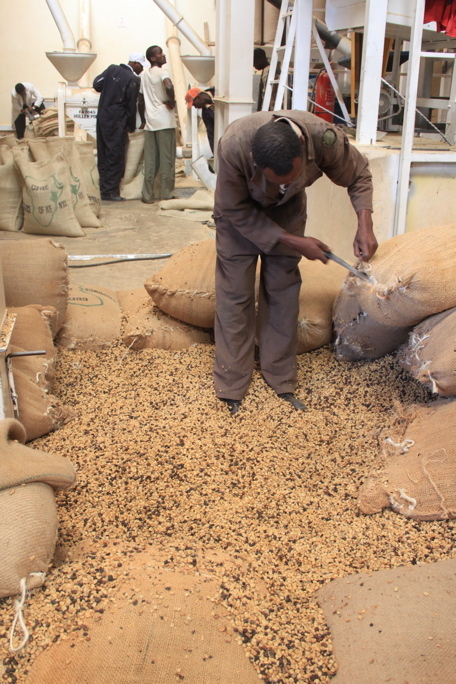 The hand pickers get 200 KES per day to sort out the less than perfect parchment. Franklin reckons they have the capacity to do 1 million kg of cherry here in a year, but next for them now is the fly crop, which he expects to come in at about 100.000 kg. Moving on we passed back through Karatina on the way to the Kangocho factory. As we pulled up to the gates we could smell the pungently fermenting cherry skin collected in the pulp tower where member farmers can to come collect compost for their farms. We were greeted by manager John Muriuki, who’s been there for 15 years and today oversees the collections from 950 member farmers. When they bring their pickings they have to sort on site; any unripe and overripe go back home with them, the nicely ripe ones go into tanks as Cherry 1, while the slightly overripe goes into tanks as Cherry 2. Cherry 2 will spend a shorter time in the fermentation tanks than Cherry 1 to compensate for the extra time spent ripening on the tree. Cherry 2 will also be dried, bagged and taken to the mill separately. 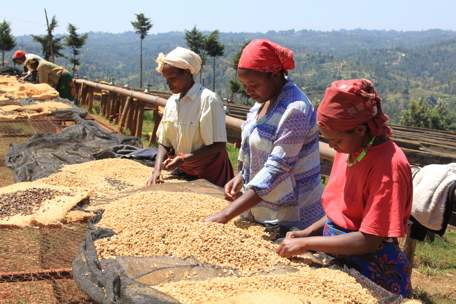 There is no difference in the price paid to the farmers for the separation work, nor a set value difference for the coop in selling it separate other than what the cup quality might land auction prices at. It’s done purely out of a quality concern. 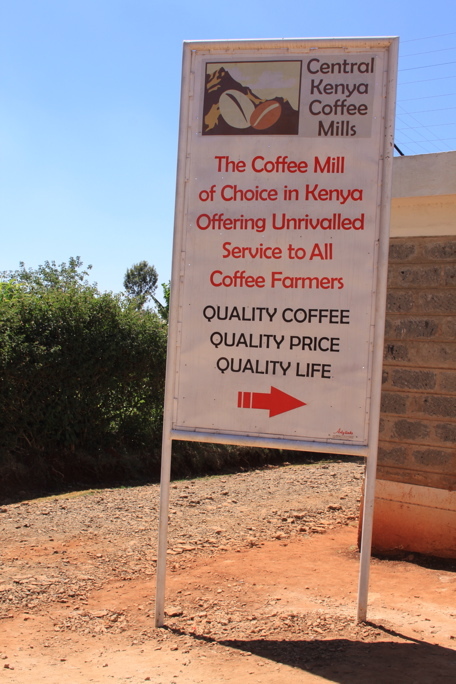 We had a great chat about the differences in hand picking in Kenya and the machine picked coffees you see coming out of Brazil, and the various stages involved in sorting with either method to make sure the coffees are processed to their best potential. It involved some very bad drawings of rows of coffee trees and barely recognizable tractors, a lot of pointing and waving of arms, and a definite feeling that I should have tried harder in art class. Kangocho did 1.049.000 kg of cherry this year, a huge jump from only 440.000 last year. Since they then received 133KES/kg they are expecting more this year, but I think they’ll be receiving a fair bit less than that. Through a 4 disc pulper and 17 fermentation tanks they do a roughly 12 hour dry fermentation, wash the coffee into the next row of tanks for another 4 hour dry ferment, before washing it into a post soak of about 16 hours more. Once ready the parchment will spend a couple of hours on skin drying tables before being moved to the final tables. 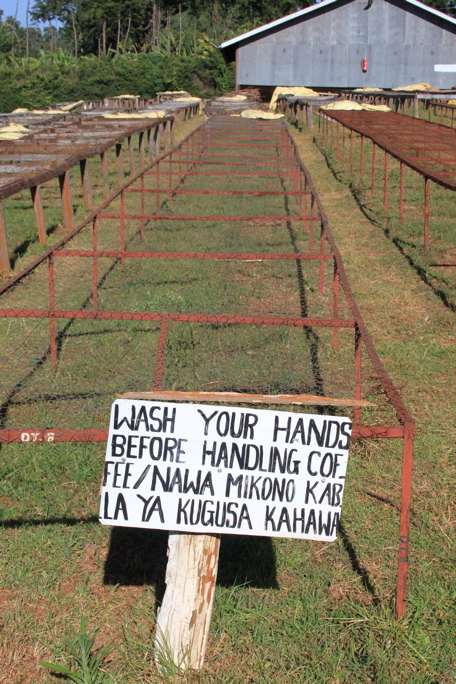 6 of the 12 skin drying tables at Kangocho are in great need of replacing, a job that John recons will cost about 500.000 KES. It seems a lot to me, for that sum I’d think he could change all 12 tables and a bit more, but either way I hope if I come back next year I’ll see some improvements having been made. The final drying tables were mostly empty but a couple were filled with parchments which based on moisture metering and the experience of John’s nose and hands would be ready by that evening. 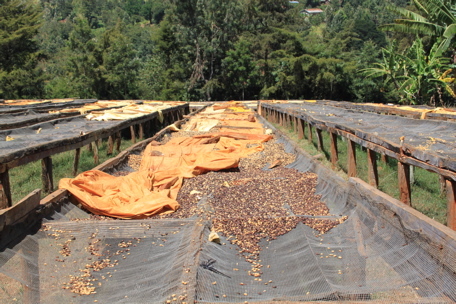 We were a bit confused by this as the parchment seemed fairly heavy still, but tuns out that instead of always drying the coffee to 12% export immediately, here they sometimes will dry the coffee down to 14 %, then place it in conditioning bins for a few weeks- or months- as we were a bit concerned to discover. The idea of this is to let the moisture equalize in all the parchment should it have dried unevenly, before taking it out to the tables again to get them to 12% in preparation for shipping to the mill. 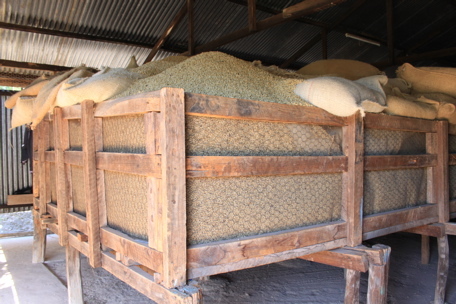 As we walked through the conditioning warehouse it didn’t immediately seem to smell or feel as if the coffee was being adversely affected by being stored here at slightly elevated moisture levels, but I’d still rather see all this parchment dried till finished and moved to the mill where atmospheric conditions are a bit better suited for longer term storage. 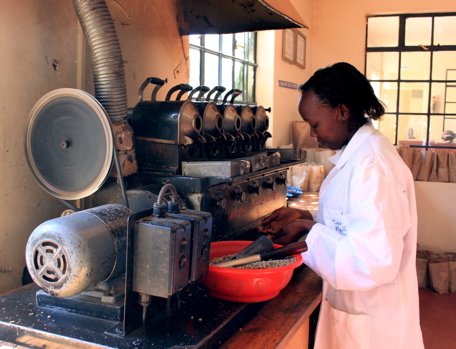 The third and last factory we visited today was a long term favourite for us; Tegu. 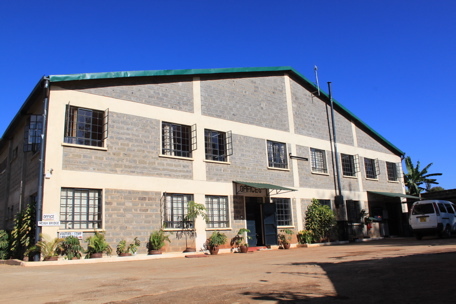 Grace Walugulu who has been managing this factory for years has just retired, and in her place as of ten months ago is now Mike Mwangi, a young guy who has been a machine operator at Tegu for the last 10 years. Mike had actually been accompanying the truck I’d seen delivering the 250 Tegu bags at CKCM earlier that day, making sure everything arrived safely and in good condition. Tegu have also doubled their production this year, processing 564.000 kg cherry, up from 234.000 kg last year. 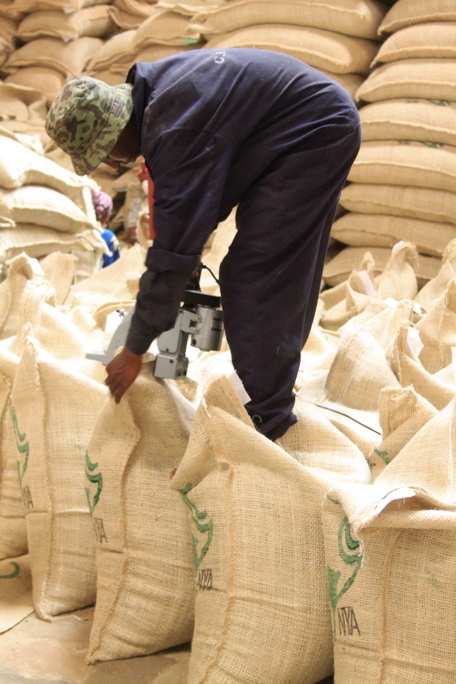 Tegu has 3 remote collection centres and covers farmers up to 6km away, and Tegu has always been one of the best paid factories in Kenya. They have 18 fermentation tanks in two rows, the top row is where the parchment spends its overnight dry fermentation before being scrubbed with water and moved down to the second row of tanks for further fermentation. The timings spent here are very dependent on weather conditions. In the past the rule was that the whole process should take 72 hours from start to finish, but now it’s done more by feel- you have to know by experience what the correct timings are at any stage of the processing. During the fly crop when the weather is cooler, both fermentation and soaking will usually take longer. I made it to Tegu! 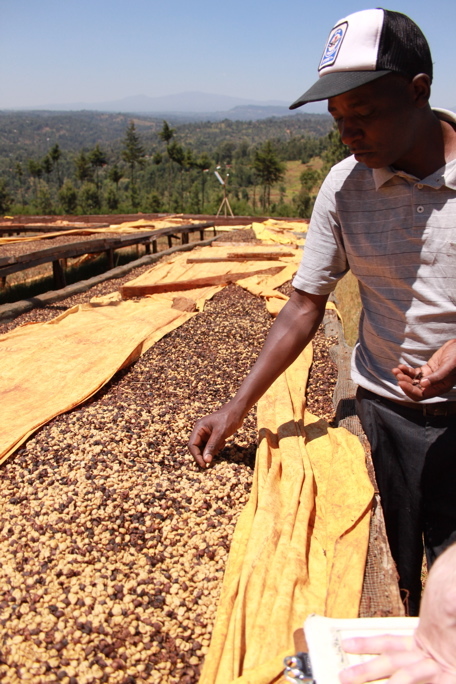 Once deemed ready, the parchment is pumped underground to the skin drying tables, which slope down on a hillside. 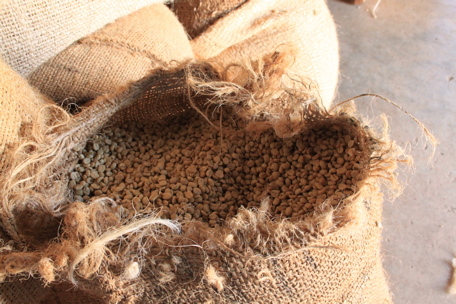 Once the water between the parchment and the green bean is gone, the coffee is bagged into sisal and carried up to the drying tables on the flatter section of Tegu. The tables here, as at most of the factories it seems, were in fairly shabby shape, most of them built out of wood that of course warps, splits and breaks with wear. One of Mikes long term plans is to get funding to replace all the wood tables with metal tables, cheaper to build and longer lasting but still a big investment at about 30.000 KES or £230 per table. He hopes to be able to change over 5-10 tables per year over the next 5-10 years, till they are all replaced. 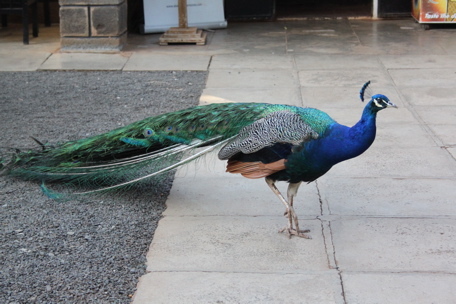 We’re now back in Nyeri and staying at the lovely Outspan, where with the lack of dogs so far, I’ve made friends with this chap instead! 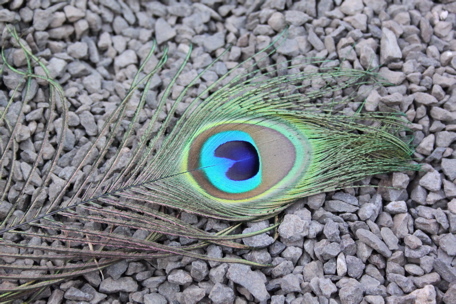 Aptly named: Peacock! I heard the crunch when he ripped it out.